Kellogg's packaged their plastic baseball cards with cereal throughout the 70s, but added a red-white-and-blue flourish for America's 1976 bicentennial, surrounding each player in an oval of freedom, motherhood, and apple pie. Today's set includes 57 players and several variations; find its checklist at Key Man Collectibles. You don't need 3D glasses to see that the Yankees haven't been clean-cut forever. 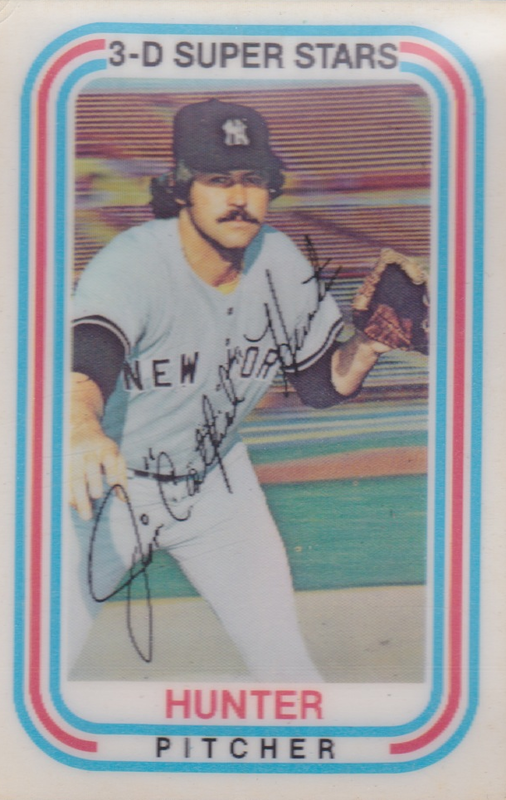 They put a lot of prominent facial hair on display in the 1970s, including one of my type card faves, Thurman Munson. Now that's a pitcher-catcher battery with something to say about the importance of quality shaving products. Holy resin bags, 30 complete games! 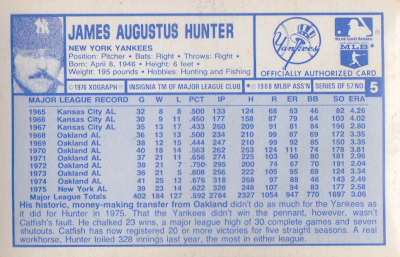 Just this week, Andy of High Heat Stats wrote about pitchers with more CGs than victories and Catfish cleared that bar by a touchdown in 1975. High Heat commenter MikeD noted that incoming Yanks manager Billy Martin rode his aces hard, even compared to other teams with 4-man rotations. "...[Billy Martin] deserves the majority of the blame. Looking back at Hunter’s gamelogs August forward, it’s just insane, even for the period, as the Yankees were out of the race. When Hunter showed up in camp the following season, there were already whispers his arm was sore and there was discussions of diminished velocity. So what did Martin do? What the heck, have him go another 300 innings and 20+ complete games." 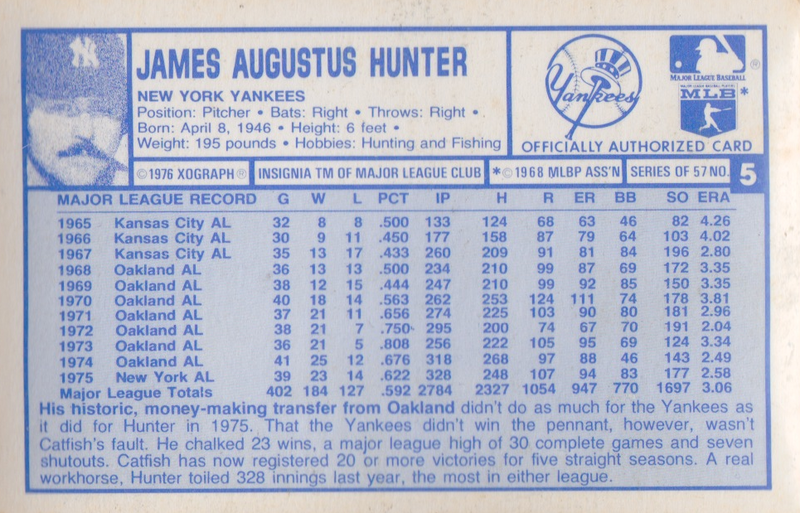 Value: This type card's in better shape than most in the collection, but Catfish still cost less than $5. They're pretty easy to find online or at shows, thanks to plentiful Kellogg's production.